Minerals Beginning with "H", "I", "J", and "K"
JC8352. Hematite. Rio Marina, Elba Island, Livorno province, Tuscany, Italy. 5.5 x 11 cm 361g. $55.00. A vug in the center has many bright, blue-steel looking blades of hematite in it. A tough specimen to photograph as it is highly reflective. All of the white areas are actually reflected light off brilliant hematite cleavages. The entire specimen is composed of hematite. JC8025. Hematite. Rio Marina, Elba Island, Livorno province, Tuscany, Italy. 3.7 x 5.5 cm 85g. $40.00. Nicely crystallized hematite specimen from this historic locality. JC7305. Hematite, quartz. Jinlong hill, Longchuan county, Heyuan prefecture, Guangdong province, China. 5 x 6 x 8 cm wide. 175g. $250.00. A far better than average specimen with nice clean bright quartz crystals mixed with the bladed hematite (Chinese are calling these specularite). One hematite rosette on the top has been slightly bruised. ON SALE, TAKE 20% OFF THE MARKED PRICE. JC7305. Another view. The bruised hematite shows as a small whitish area on the top right of the specimen in the photo. JC9766. Hemimorphite. Santa Eulalia district, Mun. de Aquiles Serdan, Chihuahua, Mexico. 5 x 5.5 x 10 cm wide. 196g. $175.00. A superior hemimorphite from here, with crystals to 5.5 cm tall. A minor dot of hematite matrix on the tips of a couple of crystals, and one small ding seen as a white spot about half way up the main crystal group, visible in this photo. JC9234. Hemimorphite. Kimbanga prospect, Kimbedi, Mindouli district, Republic of Congo. 7 x 8.5 cm 264g. $125.00. Light blue crystals from this recent, apparently one time find. Minor ding in one spot. JC9227. Hemimorphite. Kimbanga prospect, Kimbedi, Mindouli district, Republic of Congo. 5 x 6 cm 103g. $75.00 Light blue crystals with a hint of iron staining here and there. JC9219. Hemimorphite. Noble Pit, Sterling Hill, Ogdensburg, Franklin mining district, Sussex county, New Jersey. 8 x 9 cm 510g. $150.00. Ex Art Smith collection. Nice example of "maggot ore" as these were called. Lustrous, well formed stubby crystals forming a mass with a nice hollow in the center. Better than average specimen. JC7914. Hemimorphite. San Antonio Mine, East Camp, Santa Eulalia District, Mun. de Aquiles Serd�n, Chihuahua, Mexico. 5.5 x 6.5 cm 63g. $40.00. Nicely developed fans of hemimorphite. JC7735. Hemimorphite. Skorpion mine, Rosh Pinah, Luderitz district, Karas region, Namibia. 4 x 5 cm 70g. $25.00. Clear, bladed crystals. JC7730. Hemimorphite. Sterling Hill, Ogdensburg, Franklin district, Sussex county, New Jersey. 5 x 6 cm 138g. $300.00. A true rarity these days, and hardly ever available for sale in this quality. A nice solid group of bright, lustrous crystals giving a slightly botryoidal look. Excellent specimen for the locality. ON SALE, TAKE 20% OFF THE MARKED PRICE. JC7342. Hemimorphite. San Antonio mine, West Camp, Santa Eulalia, Chihuahua, Mexico. 5 x 8 cm 166g. $35.00. A somewhat older piece, collected in 1974. Fat, stout, hemimorphite perpendicular to the matrix. Tough to photo. JC9308. Hessonite. Faiallo Pass, Liguria, Italy. 3 x 5.2 cm 56g. $25.00. Small wine colored crystals with minor chlorite. JC6137. Hessonite. Mana mine, Barango-Turghao (Mor-Darra), Bajaur agency, Federally administered tribal areas, Pakistan. 3.9 x 5.3 cm 101g. $350.00. From a recent find, a lot of singles of these have come out, but not many groups such as this. A pleasing honey orange color. There is some damage to the crystals on the edges and back of the specimen, and this can be readily seen in the photos. JC9742. Heulandite. Jalgaon district, Maharashtra, India. 3.5 x 4.5 cm 22g. $6.00. A 3 cm tall crystal. No obvious damage. JC8747. Heulandite. Jalgoan district, Maharashtra, India. 4.5 x 4.5 cm 95g. $28.00 Celadonite inclusions. Single crystal. Photos of both sides. JC9800. Hubnerite, quartz. Huayllapon mine, Pasto Bueno, Pampas district, Pallasca province, Ancash department, Peru. 10 cm tall x 11 cm wide x 11 cm deep. >1,000 g. $100.00. Twenty or so hubnerite crystals embedded in clear, bright luster quartz crystals. This is more of a side view in this shot. The larger quartz crystal sticking up to the right of the specimen has minor chipping on the termination. 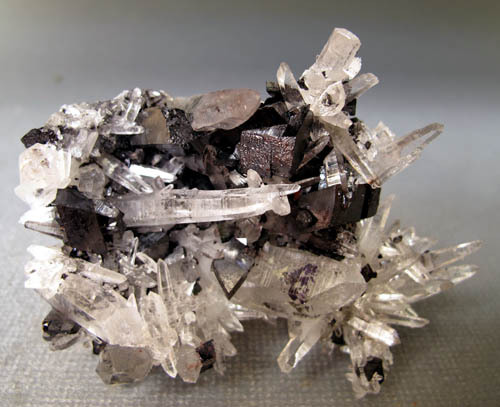 Most of the crystals of hubnerite are terminated, though some have somewhat raggedy looking terminations. A few show rub marks on the tip of the crystals. JC9803. Hubnerite, quartz. Huayllapon mine, Pasto Bueno, Pampas district, Pallasca province, Ancash department, Peru. 4 x 6.5 cm tall. 152g. $25.00. About 6 parallel growth crystals with quartz...4 of the larger crystals have broken terminations on the top end, and somewhat blunt terminations on the bottom end where they were embedded in quartz. The thinner crystals seen protruding a bit above the larger crystals with the broken end are terminated and show bright, blood red color when backlit. JC9804. Hubnerite, quartz. Huayllapon mine, Pasto Bueno, Pampas district, Pallasca province, Ancash department, Peru. 3 x 4 x 5 cm tall. 109g. $40.00. Half a dozen or so hubnerite crystals embedded in clear, bright luster quartz crystals. The three front most crystals, nested down in the quartz and not sticking up above the quartz crystals are broken. 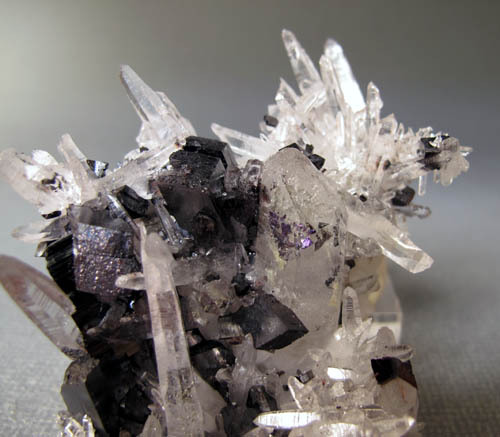 The taller crystals toward the back are all terminated. Bright blood red hubnerites when back lit. JC9805. Hubnerite, quartz. Huayllapon mine, Pasto Bueno, Pampas district, Pallasca province, Ancash department, Peru. 3 x 5 x 6 cm tall. 104g. $35.00 Several brilliant luster hubnerite crystals with a shelf of quartz crystals sticking out to the sides. The hubnerites are terminated, although one has a somewhat raggedy looking termination, it is not damaged. JC9805. Another view, back side. JC9808. Hubnerite, quartz. Huayllapon mine, Pasto Bueno, Pampas district, Pallasca province, Ancash department, Peru. 1.5 x 2.5 x 5cm tall. 43g. $30.00 Three main parallel growth crystals with smaller, thinner satellite crystals. The main crystals are terminated, with the termination on the rear crystal showing some rubbing. This is visible on the left photo, the crystal to the back showing a bit of red coloration. Brilliant luster to the crystals. JC9808. Another view(s). The rub mark to the rear crystal is visible as a reddish color. JC9809. Hubnerite, quartz. Huayllapon mine, Pasto Bueno, Pampas district, Pallasca province, Ancash department, Peru. 3 x 3.5 x 6 cm tall. 101g. $50.00. Two main crystals in parallel growth with several smaller satellite crystals. The edge of one of the main crystals shows a minor ding and a bit of a cleavage face. Brilliant luster on all crystals, with flattish terminations that have bright luster also. JC9810. Hubnerite, quartz. Huayllapon mine, Pasto Bueno, Pampas district, Pallasca province, Ancash department, Peru. 2 x 4.5 cm tall. 18g. $25.00. Three parallel growth crystals with brilliant colorless quartz crystals. Brilliant luster on the hubnerite crystals, well terminated with no obvious damage. Nice miniature. JC9208. Hubnerite, quartz. Huayllapon mine, Pasto Bueno, Pampas district, Pallasca province, Ancash department, Peru. 7.5 x 7.5 cm 303g. $60.00 A single well terminated 3.2 cm long crystal, with ruby red internal reflection in bright light, implanted in a quartz vug. Minor saw mark on the base. JC7352. Hubnerite. Zaca mine, Colorado Hill, Loope, Monitor-Mogul district, Alpine county, California. 4.5 x 6.5 cm 130g. $18.00. Sawn base. Rarely seen are the hubnerite specimens from this long closed mine. The hubnerite forms brown sprays in quartz vugs in massive quartz and silicified rhyolite. JC7352. Another view, close up. JC7356. Hubnerite, quartz. Zaca mine, Colorado Hill, Loope, Monitor-Mogul district, Alpine county, California. 6 x 7 x 7.5 cm 362g. $20.00 Sawn base. Rarely seen are the hubnerite specimens from this long closed mine. The hubnerite forms brown sprays in quartz vugs in massive quartz and silicified rhyolite. JC6804. Hubnerite, quartz. Mundo Nuevo, Labor Gallitos, Huamachuco, Sanchez Carrion prov., La Libertad dept., Peru. 6.5 x 8.5 cm. 171g. $165.00. 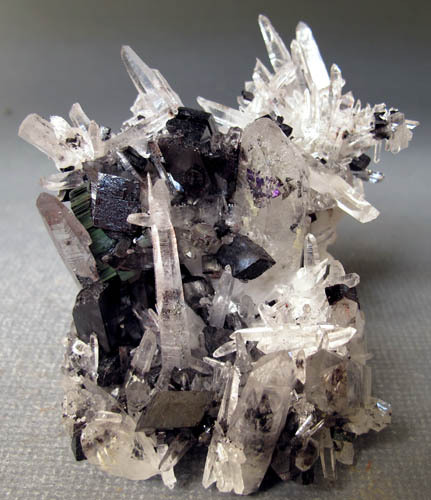 Stout crystals scattered in (as inclusions) and on quartz crystals. Although hard to spot, as the quartz crystal in the center is so clear, it is full of small hubnerite crystals as inclusions. 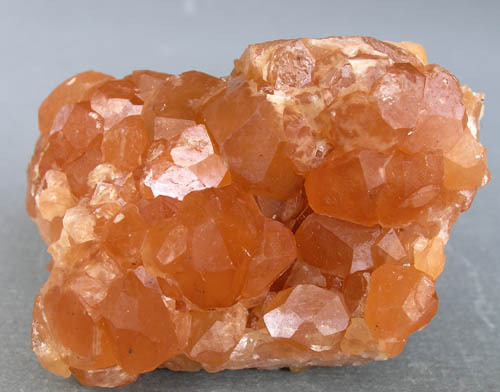 The quartz crystals on the bottom of the specimen also have numerous hubnerite inclusions. Better in person. JC6804. A different view. 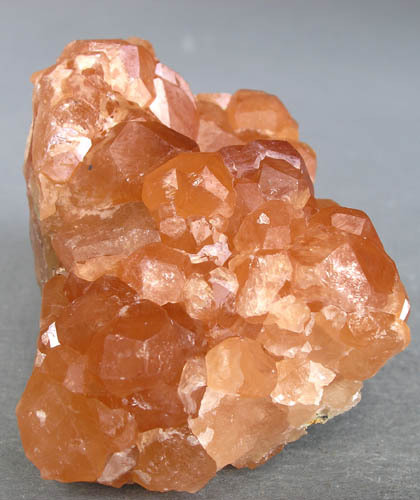 The larger quartz crystal with the hubnerite inclusions is now in the lower center, with the termination pointed to the right. JC6804. A closer view of the main quartz crystal with inclusions and the cluster of hubnerite crystals. JC6805. A view with the bottom of the specimen on the table surface. The large crystal on top is visible with the termination pointed towards the camera. JC6805. Another view, with the large hubnerite lying flat on the top a little more visible. JC6805. In this shot I turned the specimen sideways to show the edge of the top crystal, and the large crystal on the left side is visible edge on. JC6805. A close up of the many smaller blades on the front of the specimen. JC6805. A vertical view looking down on the specimen showing the large hubnerite on the top. JC6805. In this shot I angled the specimen so the large crystal on the left side is more obvious. The large crystal lying flat on the top of the specimen can be clearly seen on the very top back. Note the many internal red reflections. JC8052. Inesite. N'Chwaning II mine, Kuruman, Northern Cape province, South Africa. A 6 cm tall crystal. $100.00 Somewhat raggedy, quite large crystal. Unusual for its size, but no good termination . ON SALE, TAKE 20% OFF THE MARKED PRICE. JC7803. Inesite. N'Chwaning II mine, Kuruman, Cape province, South Africa. 2.5 x 3.3 cm 6g. 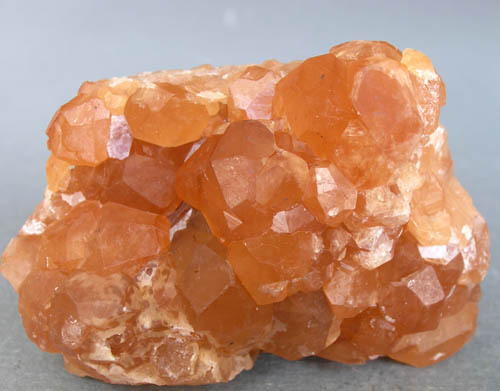 $25.00 Typical acicular sort of orangish red crystals. JC7807. Inesite. N'Chwaning II mine, Kuruman, Cape province, South Africa. 3 x 4 cm 25g. $35.00.